Killer! 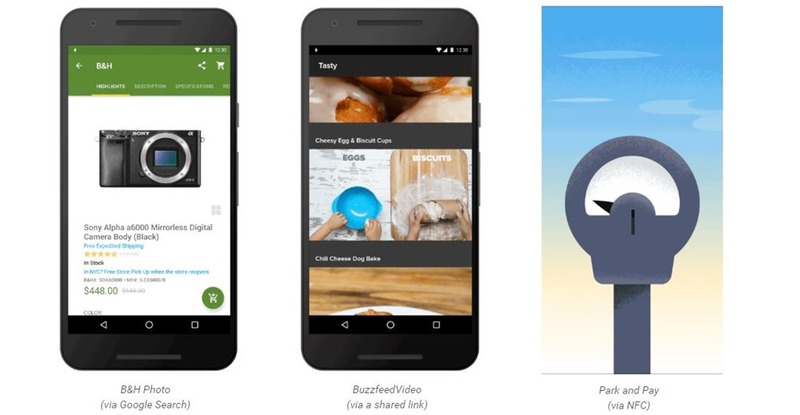 Android Instant Apps Will Allow You to Use Native Apps Without Installing! We all love native mobile apps – they are fast, have much better user experience and are made specifically to operate on a small mobile screens. However, on the downside, mobile phone users can only have a limited number of apps on their mobile phones. And, many times, apps are needed to be used only once. And for that one time, the user has to download the app, install and then use it, which is not only a time consuming process, but also adds up to your precious mobile data usage and the space! Android has identified this problem and have come up with a killer solution, that may well change the way we use mobile apps. Infact, with this new approach, you may never need to download the app, and is still accessible and can be used when it is needed! Called Android Instant Apps, this new feature will allow users to experience and use the app without downloading it. So, a user can have an immersive native app experience instantly without the need of app download. Thankfully, Android developers do not need to develop a new app for this feature to work. The developer only needs to make some changes to their existing app to make it compatible. Even to make necessary changes, the developers need to work on same Android APIs, the same project, the same source code. Google claims that these changes are quite easy and can take less than a day to get up and running for some developers, though the effort involved will vary depending on how the app is structured. The update essentially needs the app to be modularized. Once it is done the mobile users should be able to download only the parts that are needed, on the fly. This new functionality is supported on Android devices going back to Jelly Bean OS. Here is a video that gives you a wonderful overview of Android Instant Apps. This one feature has potential to change how we access content on our mobile phones. Till now it was either through browser or through native apps. The Instant apps feature gives you the best of both the worlds. The quick and easy access of a browser while an immersive native user experience of a mobile app. This will let users access mobile apps much more seamlessly and users will never need to download apps which they use infrequently and yet have access to them all the time. Given that this is a significant move, Google is moving forward very cautiously – they don’t want this go wrong and hence are opening up in a slow phased manner over next year or so. Currently they have opened the platform for only handful of developers and will increase numbers as time passes by. "Killer! Android Instant Apps Will Allow You to Use Native Apps Without Installing! ", 5 out of 5 based on 5 ratings.